It's only the second car to receive the RWB tuning treatment in the US. It isn’t unusual to see rare air-cooled Porsche 911s sell for extortionate amounts of money at auctions, but this example is more unusual than most. That’s because this 1991 Porsche 911 Carrera 2 Targa has been extensively modified by Japanese aftermarket tuner RAUH-Welt Begriff. This particular model is only the second car to receive RWB’s tuning treatment in the US, and it’s probably safe to say that the extravagant exterior won’t please purists. A widebody kit gives it a more menacing presence, as do the racing-style air flicks on the front and gaping wheel arches. Fitted with a five-speed gearbox and rear-wheel drive, it also has a Stage 2 Hakama aftermarket kit with V3 coilover suspension, and 18-inch Floss Designs alloys in a brushed bronze finish. 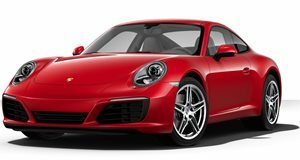 The interior is mostly unchanged, but it has been modernized with a custom sound system featuring a touchscreen and backup camera to make the sports car appear ahead of its time since such features weren’t offered by Porsche in 1991. RM Sotheby's estimates that this polarizing Porsche will sell between $95,000 and $105,000 when it goes under the hammer in Santa Monica.